You can get by on very little in the bathroom, but adding accessories keeps your space organized with the items you need easily accessible. Decorative bathroom items add a customized look to the space and make it cozy, energizing or whatever other ambiance you want to create. Referring to a list of bathroom items helps you decide what you need in your space. The sink is often the center of activity in the bathroom, especially in the morning when you're getting ready. Adding organizational sink accessories keeps the space looking tidy and makes it easier to find what you need. Vanity accessory sets often include soap dispensers, soap dishes, cups, toothbrush holders and similar items, but you can also get creative with the items you use. A tiered rack on your vanity top offers multiple levels of storage to keep items organized. Mason jars and similar containers also work well either on the tiered rack or sitting on your countertop. They keep similar items together, making everything easy to find. Small items are contained easily so you don't have to worry about spills or messes. 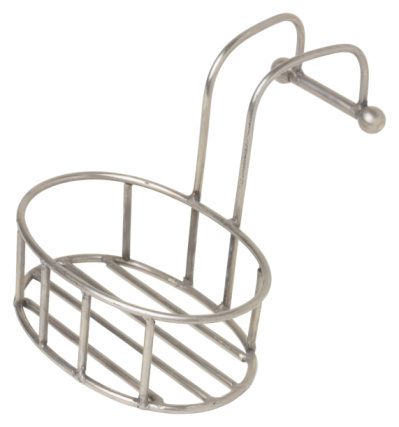 Heading into the shower, a simple accessory is a shower organizer. If you have a fixed shower head, you can slip a hanging organizer over the pipe to keep shampoo, soap and other shower essentials close. Another option is a corner organizer that uses tension between the ceiling and the edge of the tub to stay in place. These accessories keep your shower area organized and prevent bottles from falling into the tub every time you shower. Another way to accessorize your shower is with a decorative shower curtain and hooks. It's a simple change that can make a big difference in how your bathroom looks. A bold color or a thematic design sets the tone for the bathroom, and it's easy to install. Attaching fixtures to your bathroom walls adds to the overall look while adding functionality to the space. Towel rings work well for hanging hand towels near the sink. For bath towels, install towel bars or towel hooks near the shower to have easy access. Another common fixture is a wall-mounted toilet paper holder within reach of the toilet. Lighting is important in the bathroom. You likely already have a light bar above your vanity and an overhead light, but adding extra lighting can add a cozier feeling. If your bathroom is large enough, add a lamp to add soft, warm light. Other lighting accessory options include a chandelier, wall sconces, string lights and faux candles with LED flames. Not everything on the bathroom accessories list has to have a functional use. Adding decorative accessories to your bathroom lets you customize the space and create a desired look or theme. When choosing decorative pieces, consider how well they'll hold up in a warm, humid environment. Space is often at a premium in bathrooms, so adding organizational and storage accessories helps you maximize that space. Shelving takes advantage of the vertical wall space in the bathroom. Glass shelves hold up well in humid bathrooms, and they're easy to clean. If you have enough floor space, consider adding a freestanding shelf for towels, extra toiletries and decorative accessories. If you need seating and storage, you can add a storage bench or stool to the bathroom. A small storage stool can slide under a vanity to work as both seating and storage. Larger benches might have a lift top for storing towels inside or an open bottom with baskets to store a variety of bathroom items.